Hey guys! Here’s a quick and easy mid-week recipe for you. I love using my Instant Pot to bust out tender chicken in under 30 minutes (or any ingredient, really). 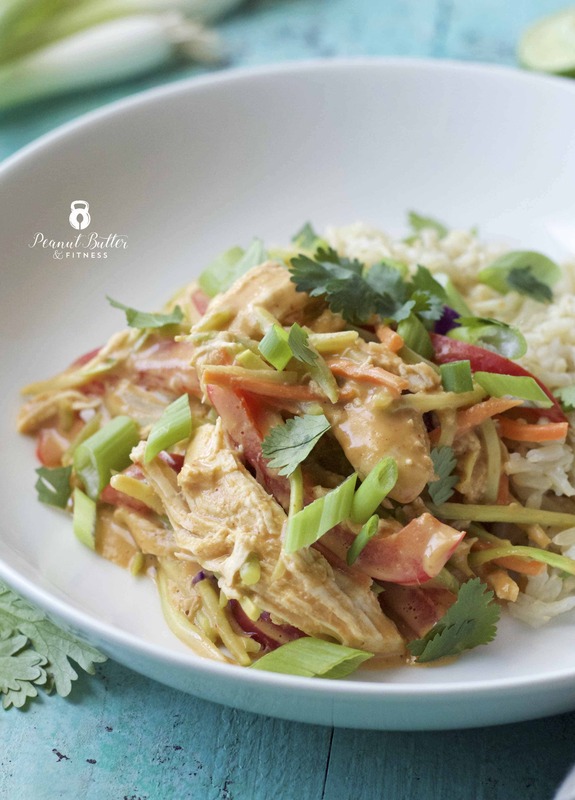 You could totally use a slow cooker for this recipe too, but then you’d have to wait for way longer to enjoy the creamy deliciousness that is this Thai Peanut Chicken. I tossed the bell pepper and broccoli slaw in for a quick sauté for just a few minutes because I like to preserve the tender-crispness of them. You could certainly sauté them for longer if you like your Thai veggies to be a little softer. And yeah, broccoli slaw is totally not Thai, but it is totally the right veggie combo for this dish. Trust me. Enjoy the rest of your week and happy hump day! Whisk all sauce ingredients except PB2 and peanut butter (they will burn if you put them in before cooking). Pour 1/2 into the bottom of the Instant Pot. Add chicken, then add remaining sauce. Set Instant Pot for 12-14 minutes (do 14 mins for thicker pieces of chicken), followed by manual release. 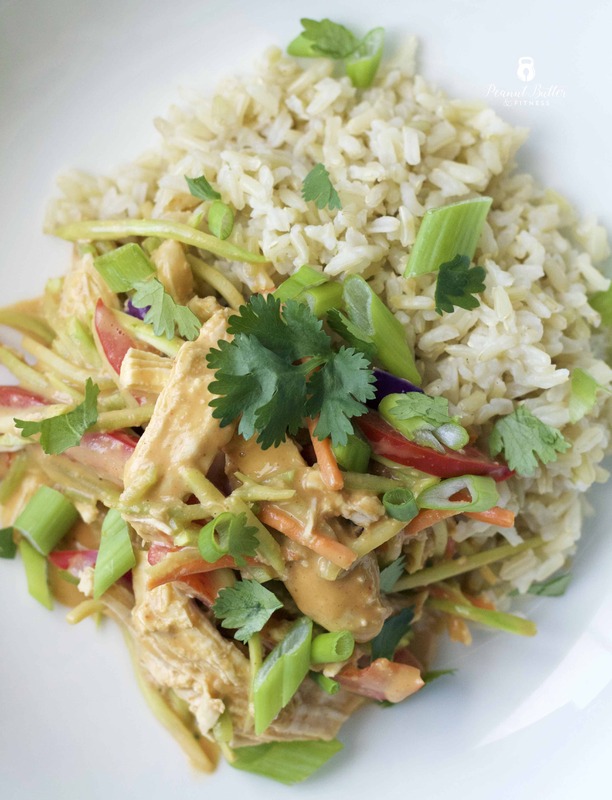 Remove chicken, shred, and set aside. Pour sauce into a bowl and whisk in PB2 and peanut butter. Set Instant Pot to sauté and add sauce back into bowl. Add bell pepper and broccoli slaw and sauté for 5 minutes or until pepper begins to soften slightly. Return chicken to mixture and stir to coat. Add a little chicken stock if the sauce is too thick. 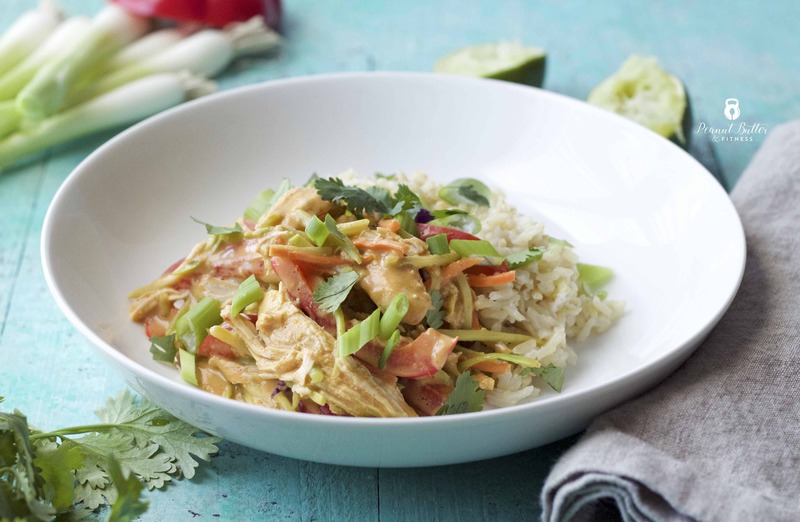 Serve chicken mixture over a bed of rice and top with fresh cilantro, green onions, and peanuts (if desired).